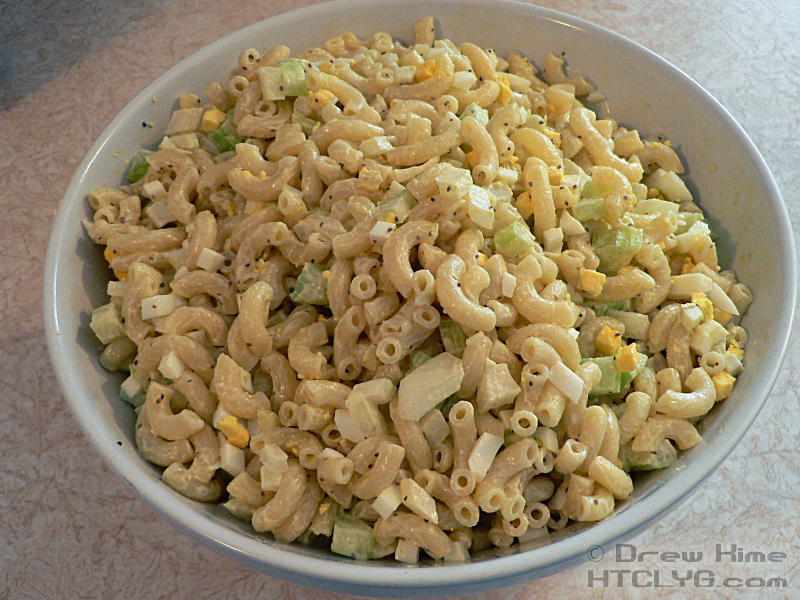 I’ve never liked the pre-made macaroni salad you get at the grocery store, with over-cooked noodles swimming in in runny, watery dressing. 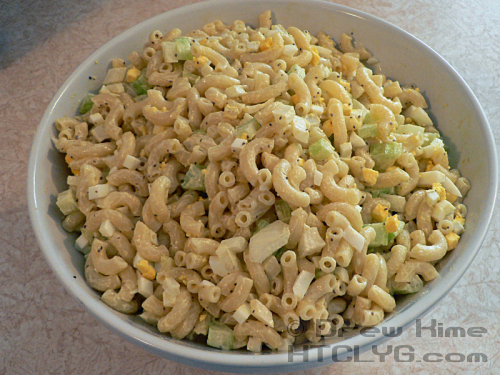 This version comes out nearly dry, the pasta soaking up most of the dressing, and with a bit of crunch from the veggies. 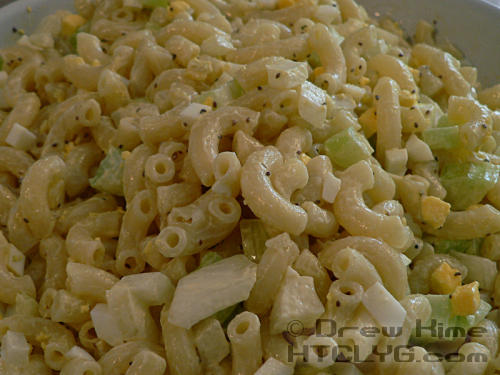 You can easily substitute cooked, cubed potatoes for the macaroni and have a really good potato salad. 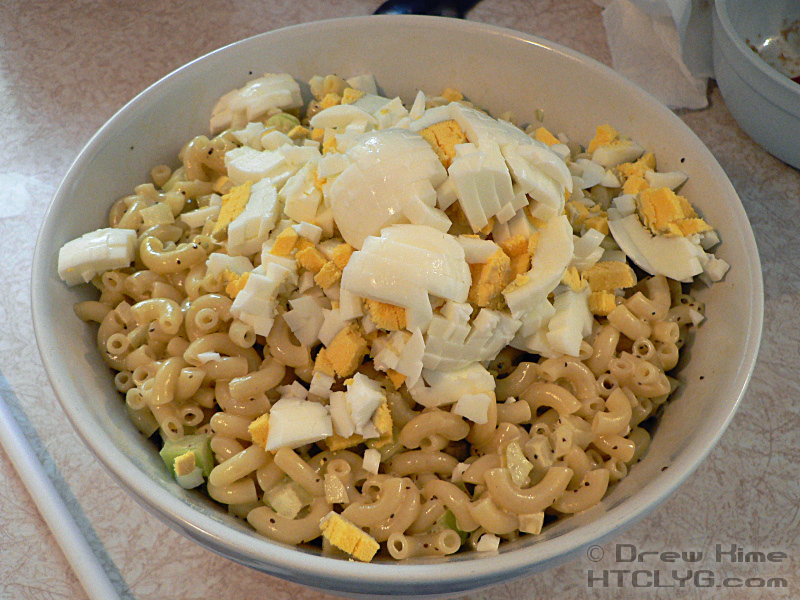 Boil the eggs and cook the pasta the way you normally do. When the pasta is done and you have drained it in a collander, mix it under cold running water until it is completely cool. If you use your hand to mix it, you’ll be able to tell when it’s cooled down. 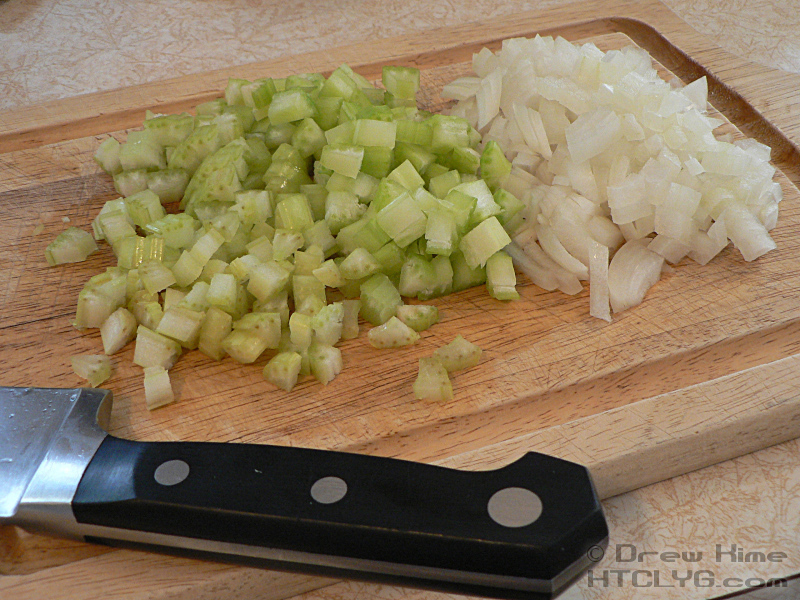 While the pasta is cooking, dice the onion and celery according to the directions for making mirepoix. Put the ingredients in a tall, narrow cup or jar in the order listed, lower a stick blender in, turn it on and slowly pull it up to the top. Instant mayonnaise. 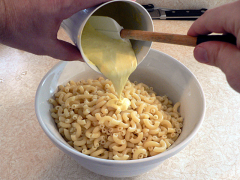 Pour it into the macaroni. 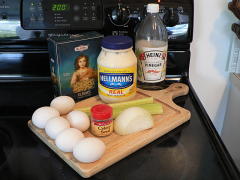 Or add one cup of prepared mayonnaise. 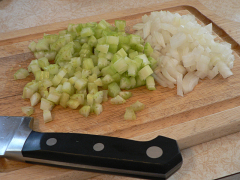 Add the onion, celery, vinegar and celery seed and mix well. Scoop down along the side using a silicone or rubber spatula, and lift from the center. Here’s a quick clip showing what I’m talking about. Dice four of the eggs according to the directions for how to dice hard boiled eggs. It’s easiest do the third slice directly over the bowl. Mix again, gently so you don’t mash up the egg. You want both the white and yellow bits to stay whole. 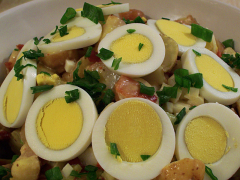 If you are taking this to a potluck, the traditional presentation is to slice a couple more eggs and place the rings on top, the way I did in potato salad with bacon and egg. I brought some of this over to my in-laws, and my father-in-law noted how much drier it was than what he is used to. There’s two parts to this. First, yes it is drier. That’s how I like it. 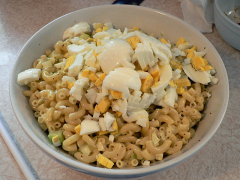 Second, the macaroni will soak up a lot of the mayonnaise overnight. I usually add more when I’m having leftovers. This is drier than the kind you can buy in the grocery store. 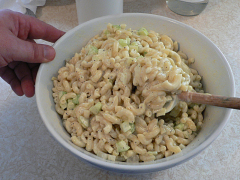 If you make it the day before the pasta will soak up most of the dressing and you'll need to add a bit of mayo to moisten it up again. Cook and drain the pasta. 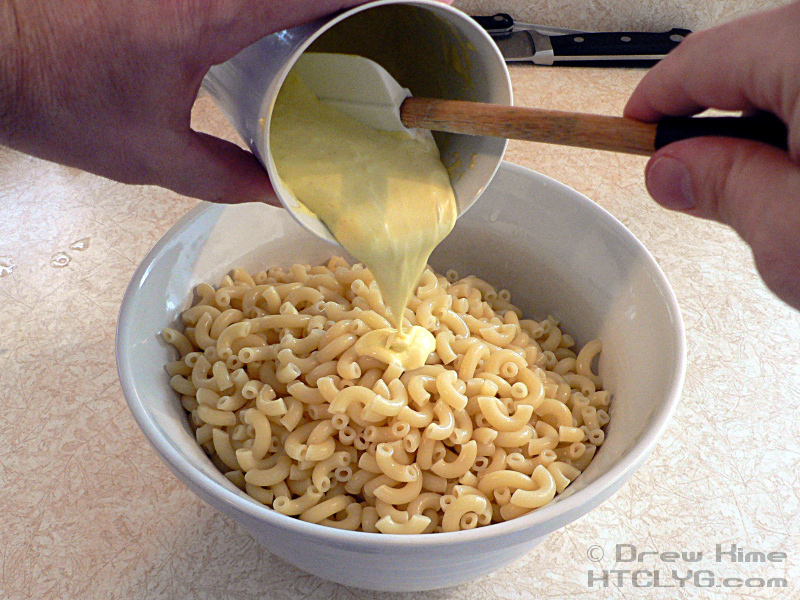 Rinse in cold water or refrigerate before adding dressing. Dice the onion and celery fine. Using an egg slicer, dice 4 of the eggs. 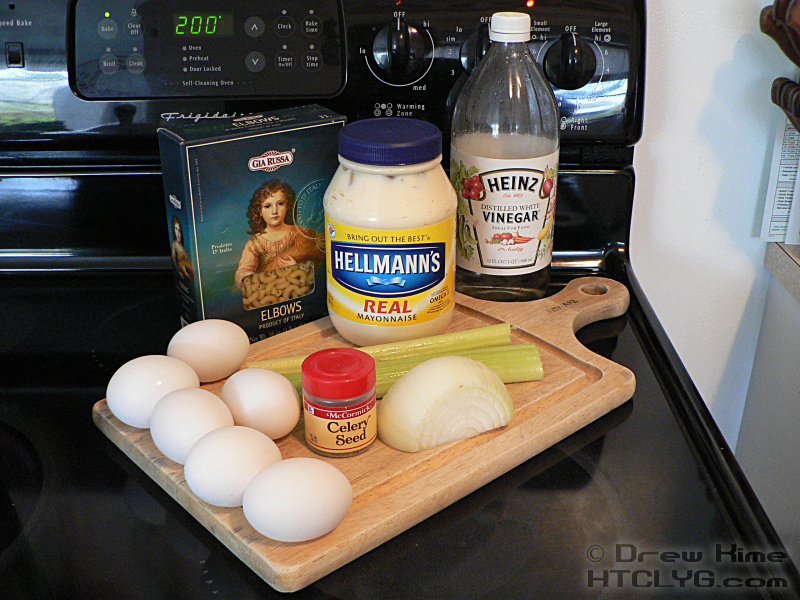 Combine the mayo, vinegar and celery in a large bowl. Add the pasta and veggies and mix well. Add the eggs last and mix gently. (You don't want to crush them. Slice the remaining two eggs and place on top of the salad in a serving bowl.